Commanders required to start the round. I'd like to see a change in how the round starts. Instead of starting when there is 1 marine and 1 alien. The round should start when there is 1 marine commander and 1 alien commander. This allows a sort of debriefing phase or allows some time for some pregame strategies to happen. Having everyone decide on a commander and having the commander let his team prepare for what he's going to do. Also allows both sides to get a fair playercount before starting. With less people spawning through eggs or infantry portals at the start of the game. Too often the marines lose because when the game starts, everyone runs out of the marine start thinking someone else is going to command, or someone else is going to build the ip. Then the commander is all alone and generally gets killed trying to protect the ip. And the aliens can easily lose when they don't have anyone to get upgrades. Just an idea from seeing rocky gamestarts far too often. Open to input. I also think that squads should be assigned during this phase. Rather than them being random and constantly changing as they are now (and pretty much useless as a result), squads should be permanent. Great idea +1 to original Post. Also spawning from ready room to game map should continue unhindered till both commanders have taken residence in command structures. Worthy's Marine Vs Marine Maps. Eventually there will be a troll team where no one hops in the comm chair, but.. I think it would be an overall improvement. I think more people would be willing to hop in the chair if they realized no one was comm BEFORE they ran halfway across the map. This plus having some percent of players in the server on teams before starting (say 80% threshold). This would prevent essentially how every public game starts, with half of the players in the ready room trying to join one team. Once the infestation reaches the Command Chair, the process begins. One Gorge enters the chair to provide the necessary height. Another climbs on its shoulders to access the controls. A Gorge Lab is quickly established, staffed by microscopic Gorges who work tirelessly to unlock the secrets of Frontiersman Technology, stopping only to change their lab coats when they become dirtied. Once the research progresses to a certain point, the Gorgecom gives the order. Nanites are called into service. The armature forms. A chosen Gorge, tested many times in the field of battle, enters the machine. Servos whir; miniguns spin up in diagnostics; an Exogorge is born. The reason you shouldn't have a percentage threshold is AFK's grief a game from beginning if there is enough of them. It's getting off topic but a AFK timer in the ready room would fix that small problem. Then I would support it. I say just let afks idle, they get an afk state after a certain amount of time, and the game may handle them as such in any shape or form. For example if somone tries to join while the game is full, you may kick the longest afk, or, if waiting for an 80% threshold, make it of active players, afk's excluded. Dynamic solutions are the future. Before anyone says "What if it's my server, and I can afk if I want. ", imagine the afk kick not applying to such people. that would be good as a community mod. maybe me, player, hackepeter or someone else will make it at some point. I personally think the commanders should have a button in the UI to indicate that their team is ready to start. This allows the commander to make sure everybody knows what the strategy is etc. This might allow some kind of griefing and might cause confusion for new players. But as long as hyou are able to eject the commander even in the pre game state it should be fine. Also some ui hints would be needed to indicate that the game has not started yet because commanders have not pressed the ready button. If one commander clicks "ready", then a one minute countdown begins, after which the game would start automatically. If the opponent commander also clicks "ready", then the round would immediately start. Good point. I was originally thinking of an automatic timer to go with it, but that would be the correct way to have it. That way one side couldn't hold the game up forever. And still give the other side a chance to think. I'd put the slight modification where there is also a "not ready" button. So the side that was ready could stop the timer if need be. I'd make this timer feature a server option so that this system could be used in scrims/tournaments. For example, you might want to have a 5 min timer (or no timer) in a scrim, but a 30-60s one for a pub. Great idea, its a wonder no one has thought of this before. and if one team defeats the other team before the round starts, then it goes back to old round start method. PROBLEM SOLVED. Both funny and effective? Cheers! I love this idea, but it would have to be a mod not a full game feature because for pub games you'd want it to automatically start. But like for the tourney or scrims or stuff then yea, it would be good. 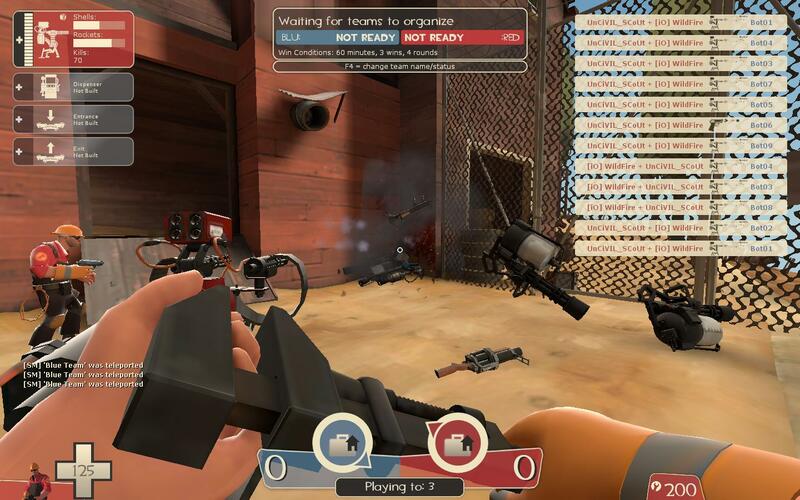 I found this tf2 screenshot to have a cool ui box that would work well with this.